William Emerson Arnett is a Canadian actor born on May 4, 1970 in Toronto. Before his Star-Making Role as Arrested Development's G.O.B. 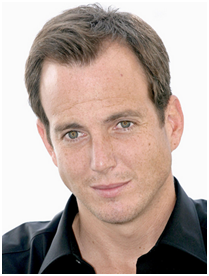 Bluth, Arnett would audition for numerous television pilots that would fail in various ways, which was discouraging for his career. Once he had made it into TV as an acclaimed actor, however, opportunities throughout film and television opened up for him. He has a distinct gravely voice and was originally in high demand as a television commercial voice-over artist, and has since done many voice acting performances, voicing LEGO Batman and the title character on Netflix's BoJack Horseman, one of his few dramatic roles (Arnett also served as producer for the first season and executive producer from season two on). He and his Arrested Development co-star Jason Bateman have a production company focusing on digital content called "DumbDumb Productions". He's also executive-producing ABC's 2017 summer revival of The Gong Show (though he's not hosting; that role has been taken by Mike Myers under the fictional persona of "Tommy Maitland"). What Could Have Been: Apparently he was a serious contender for the next boss of Dunder Mifflin on The Office, but due to fears that his role in The Millers would conflict with said part, he was turned down.